Best of the Week: Champions League Final in 4K, HTC U12+ smartphone, LG OLED 4K TV and more | What Hi-Fi? This week, Virgin Media revealed plans to show the Champions League final between Liverpool and Real Madrid in 4K, Marantz announced two new slimline AV receivers and HTC launched another squeezable smartphone in the U12+. 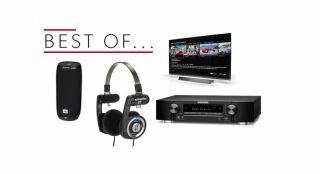 On the reviews side, there's the fantastic five-star Porta Pro headphones from Koss, LG's excellent OLED55E8PLA 4K TV and JBL's Link 20 smart speaker. Virgin TV subscribers who have the Full House package and a V6 TV box will be able to watch the Champions League final in 4K. This is the first time Virgin Media has broadcast live football in UHD, and you can catch the action by tuning in to channel 100 on Virgin Media on Saturday evening. It's not the only way to watch it, as you can catch the action in 4K through the BT Sport channel or via YouTube. Marantz has announced two new slimline AV receivers, the NR1609 and NR1509. The 7.2 channel NR1609 has support for HEOS, Dolby Atmos, Dolby Vision HDR and Hybrid Log-Gamma, while the 5.2 channel NR1509 supports Dolby TrueHD and DTS-HD Master audio. HTC's latest phone is a return to its 'squeezable' design philosophy. The U12+ encourages users to squeeze or tap the sides of the phone to trigger shortcuts and functions. It sports a 6in LCD screen (2560 x 1440 resolution), with support for HDR via YouTube, Bluetooth 5 and a selection of smart assistants including HTC's own Sense Companion. The 64GB version is available to pre-order now, priced £699. "Koss Porta Pros are a product we can fully get behind"
The Koss Porta Pros look like a cross between a headphone and an 80s-era headband. It's no surprise to discover they are from that decade, with the design first introduced in 1984. It's one that emphasises the lightweight and portable nature of these open-backed cans. For £25, they produce a fantastic performance. Fun and energetic, they boast decent punch and detail with good bass and treble performance. As a cheap pair of frills-free headphones, they're a great option. The Link 20 is a Google Assistant smart speaker that's small enough to fit into your rucksack, but with enough battery juice to last a whole day. Well, ten hours to be exact. And you get a speaker that's good at dynamics, is well balanced and has a decent ear for detail. The sound quality could offer a little more nuance, and the Google Assistant needs wi-fi to work, which is a problem if you intend to use it when you're out and about. "One of the best performing and best equipped 55in TVs we’ve ever seen"
LG's latest OLED TV is another blockbuster effort, but fails to strike the right balance between price and performance. Like other LG OLED efforts, it's a gorgeously designed TV, the picture is stunning and it has plenty of useful features. But for all that, it doesn't justify its premium price in comparison with rival 4K TVs. It's a great TV, but not the best for value for money.